We can also tell TfL what we think by email to rivercrossings@tfl.gov.uk or by writing to FREEPOST TfL CONSULTATIONS’. It’s an opportunity to tell Transport for London of our concerns about the increased traffic congestion in our area that their own traffic models predict will come as a result of the new crossings: congestion that will lead to even more dangerous air pollution and the health problems that it causes. The excellent Bexley Against Road Crossings web site has many more suggestions about what to say to TfL. 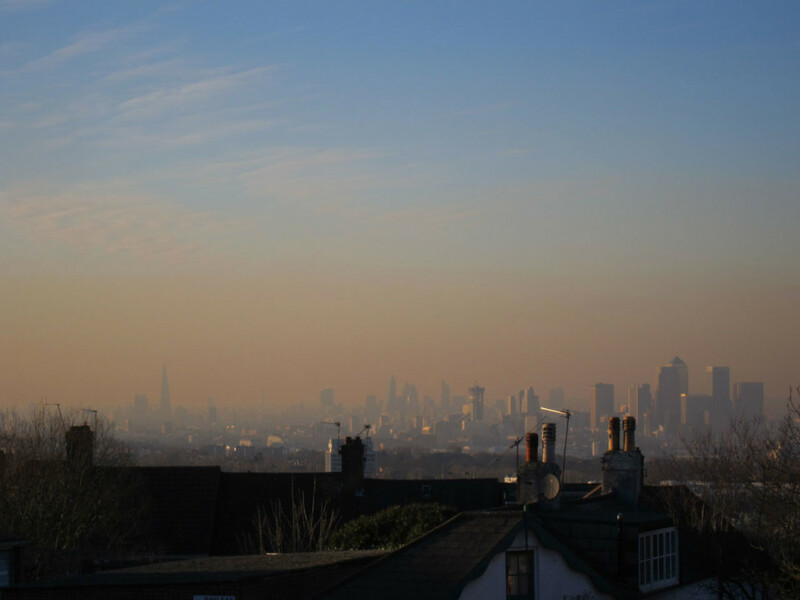 The threat of traffic related air pollution is not hypothetical. 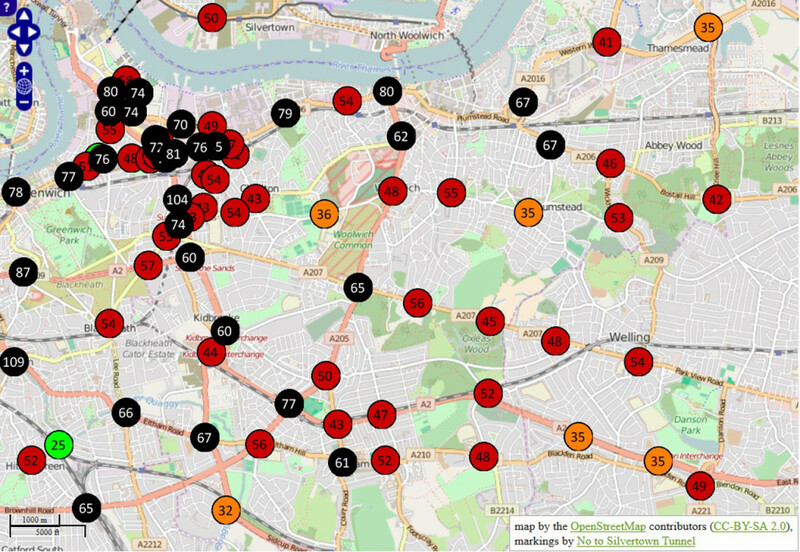 The No to Silvertown Tunnel campaign undertook an extensive citizen science project to measure Nitrogen Dioxide levels across Greenwich in 2014. A snippet of the results, which was also published on the No to Gallions campaign web site, is shown below. The NO2 results map shows that the UK Air Quality Strategy and EU legislation 40 µg m³ limit for NO2 was exceeded at most measurement locations in Shooters Hill and Plumstead: at two sites along Plumstead Common Road and all sites along Shooters Hill and Shooters Hill Road. 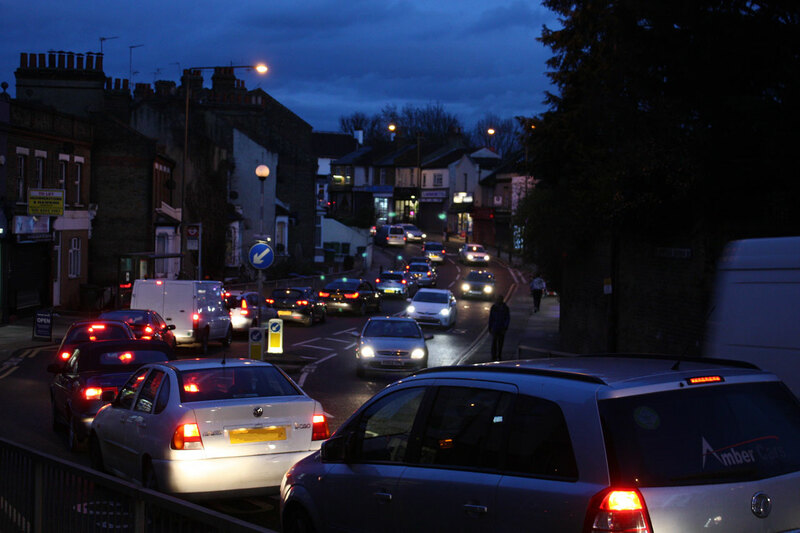 The cross roads at Shooters Hill Road and Academy Road, close to the Greenwich Free School and just down the hill from Christchurch Primary School had an NO2 level 162.5% of the limit. A similar level was detected down in Woolwich at the junction of John Wilson Street and Wellington Street, close to Mulgrave Primary School. The level near Greenslade Primary was only just below the limit. Children are particularly vulnerable to the health effects of NO2 from traffic pollution. I’ve never really understood TfL’s argument justifying new crossings by the fact that there are many more road crossings to the west of tower bridge than to the east. It seems obvious to me that you would have fewer bridges closer to the sea because the river gets wider at it nears its estuary. A better comparison might be the difference in public transport, such as the tube, between north-west and south-east London. 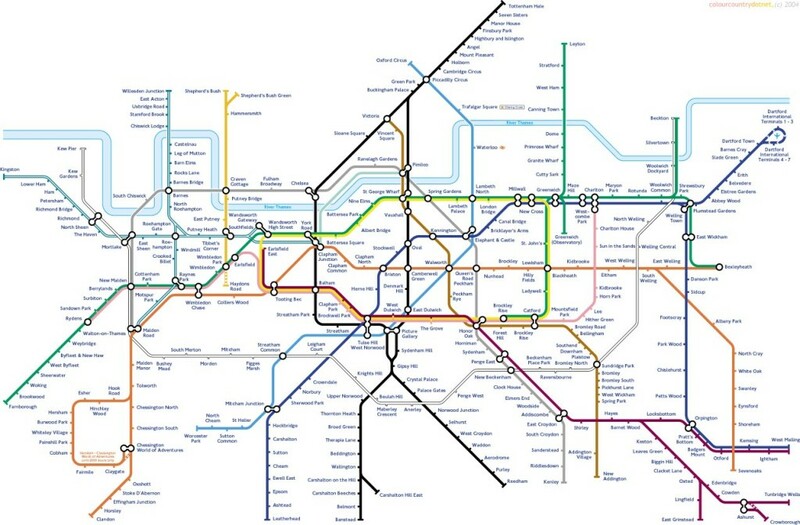 This is illustrated by the tube map variation from Geofftech, shown above, which reflects the tube map across to the south-east. If we were as well served as the other side of London we would have tube stations at the Rotunda, Woolwich Common, Shrewsbury Park and Plumstead Gardens, and the tube network would stretch as far as Tunbridge Wells. TfL would have far more chance of reducing traffic congestion and pollution by improving our current very unreliable and overcrowded public transport and creating new public transport links than by building more roads which will attract more traffic. It’s well worth reading former Greenwich councillor Alex Grant’s very informative post: The supporters of new roads across the Thames are stuck in the past. Without rail links they’d be a disaster for east London for more on the history of east London river crossings, how other modern European cities have tackled the problem of congestion and the recurrent fears that a motorway will be built through Plumstead, Woodlands Farm and Oxleas Wood. Last week Transport for London’s Board gave approval for us to submit a Development Consent Order to the Secretary of State for Transport for powers to implement the Silvertown Tunnel scheme. Our application will include a Consultation Report, which will set out our response to all of the issues raised in our recent consultation. We received more than 4,000 responses to the consultation and these are continuing to help inform our final plans. We plan to submit an application for powers to implement the Silvertown Tunnel scheme in the spring 2016, and we will contact you again at this time once we are in a position to publish our Consultation Report. If our application is accepted by the Secretary of State, there will be a public examination on the scheme managed by the Planning Inspectorate. In that case, you will have an opportunity to make written representations and take part in hearings as part of the examination. We will explain how you can take part in the examination when we write again, later this spring. Oh, and complete the TfL East of Silvertown consultation before Friday.